This is my eighth post for The Classics Club (just a couple weeks late). I’ll be reading one classic book a month for the next 4-5 years. Track what I’m reading for the Classics Club here. I’ll try not to include too many spoilers in my review but I may need to discuss some in order to fully review the book. I’ll warn you if I’m going to mention one. Will I reread this? : Probably not, just because it was so long and so many parts of it dragged on and on for me. I have to admit, I almost gave up on this one. I was bored, B-O-R-E-D, for almost the first 200 pages, which is an entire book by most people’s standards. I didn’t understand much of the politics being discussed, the characters were less than intriguing. I could tell the planned marriage was an awful idea, and I really didn’t seem much point in continuing on. Enter, “I told the world I was going to read this book so I’d better finish it.” I also was averaging about 30 pages a day, which meant that it was going to take me close to a month to finish the book, which is an eternity for me. So I buckled down, read for hours on end, ignored Nik for a few evenings, got no sewing done, and finished it in a week. In short, this was the first book in a long time that I actually had to work at to finish. Thankfully, the book shifted for me around the time that Lydgate and the other main characters entered the picture. After that, the rich texture of the book began to become apparent to me and I found myself invested in Dorothea’s [perhaps unfounded but] incredibly faithful devotion to her husband, Lydgate’s ill-fated desire to reform his profession, Rosamund’s awful treatment of her own husband, and more. I did my best to read every word of this book but still found my eyes glazing over when it came to the discussions of mid-19th-century politics and religion. I think I would have really enjoyed taking a college class devoted only to this book as it’s incredibly rich with social commentary. I’m sure that even a semester wouldn’t be enough to learn all there is to learn from delving deep into this book. As it was, most of that flew right by me as I read just for the plot itself. In the end, I’m really glad to have read this book. I probably won’t ever read it again because it’s SO long. 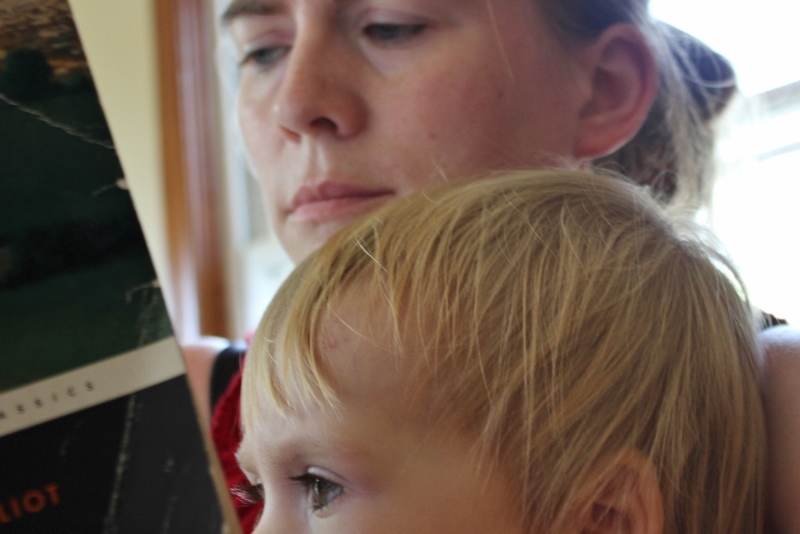 However, I do wish I had been reading my own copy because I did come upon several passages, particularly related to marriage and faithfulness, that I would have underlined and come back to had I been able to. (And yes, I know I should have been marking them with paper but I never had any handy.) So perhaps, someday, I’ll pick it up again, skip to the middle and take it on again. How about you? 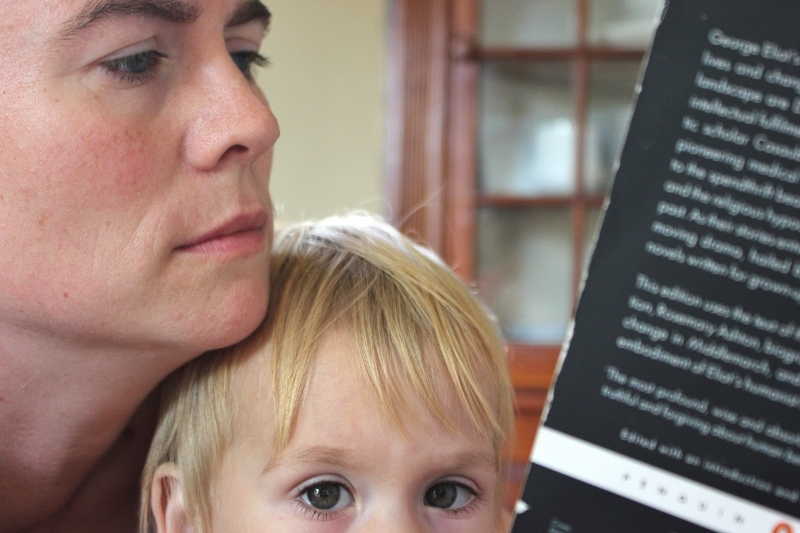 Have a favorite Middlemarch character? Studied it in college? Read it many times? Even liked the first section? Couldn’t resist two more shots with Mark featured a little more prominently (even if you can’t see the book title)! 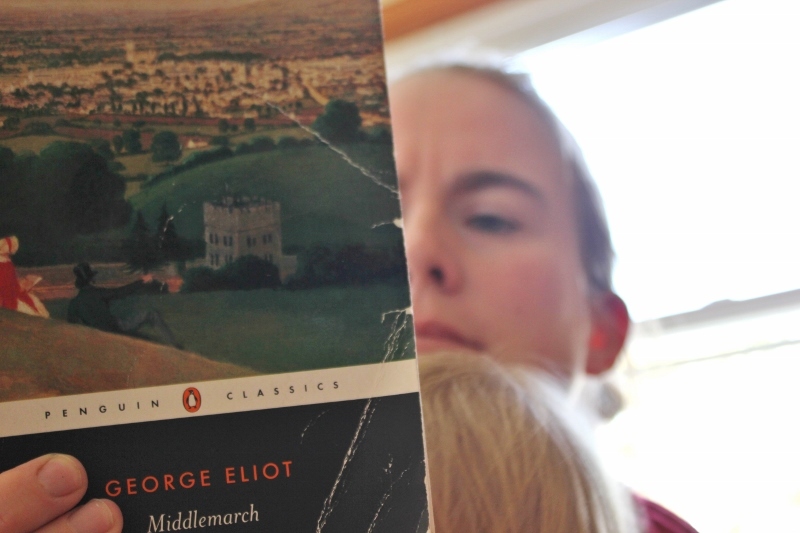 This entry was posted in books, parenting and tagged Classics Club, george eliot, middlemarch. Bookmark the permalink.